This is my bright red and green and zebra tree in our dining room. I got this tree for like 75% off a couple of years ago. I used it as our main tree last year. I have kind of collected the ornaments over the last few years and I made some of them. 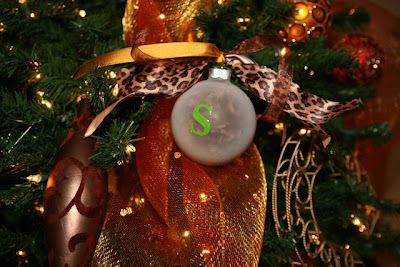 Last year I made a lot of these monogram ornaments for gifts - and I made them for our family! 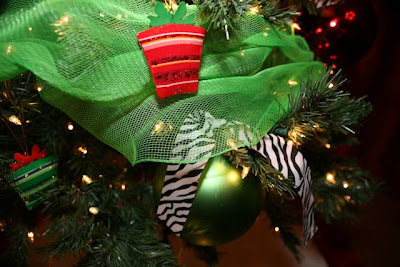 Another fun idea was to get large (or small) balls and instead of hooks - use fun ribbon to tie them on the tree. Our first year in this house - we bought this big 9 ft tree. I use a lot of golds and browns on it. 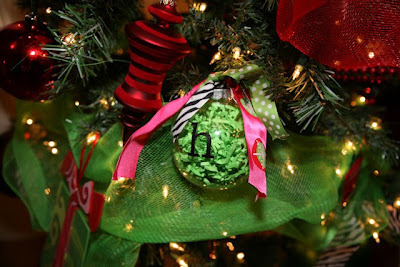 I bought these letter ornaments several years ago and bought 2 H's - just in case I ever finally got my Harper and Hudson. Or Harper and (Hadlee, Hattie, Holden, Hutton.....whatever name we use if we have another girl). ha! 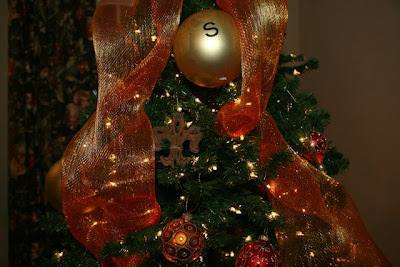 I used stickers to put our monogram on large balls on this tree also! 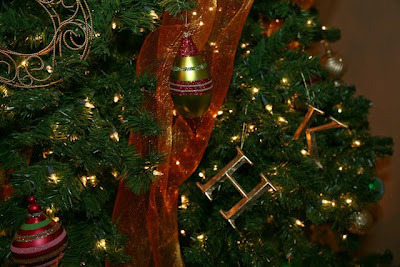 I made some more monogram ornaments for this tree last week using leopard ribbon! 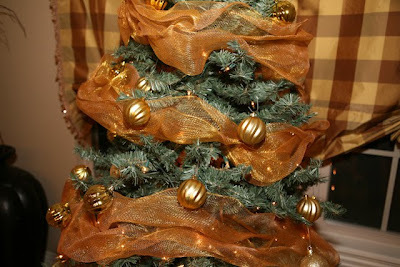 When I was single - I had this little tree and now we use it in our kitchen and I use only gold ornaments and gold mesh. My kitchen and breakfast room are all in golds and browns so I love how it looks in here. 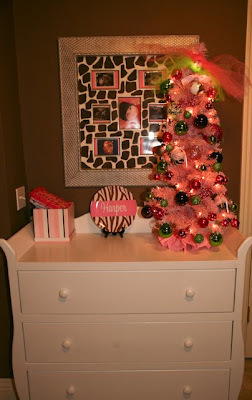 And this year I added this little pink tree in Harper's room and I'm in LOVE with it! I took down her changing pad off the dresser my dad made her a few weeks ago because she is just too big and I'm not just using it like a dresser top. 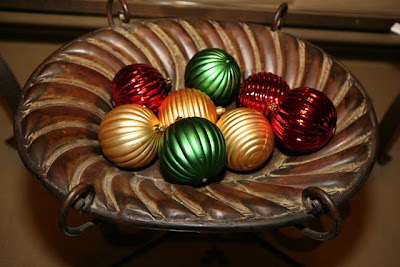 I love the pink, green and brown ornaments. I've been saving these for a while to use! A few of these ornaments on this tree were special gifts to her this year. I love these presents - they are sitting in my kitchen! 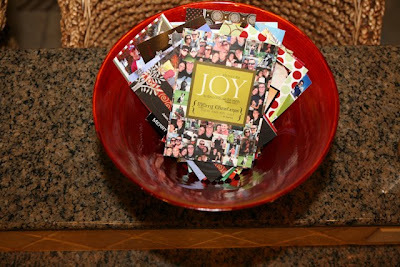 This is the bowl where I keep all my wonderful Christmas cards!!! 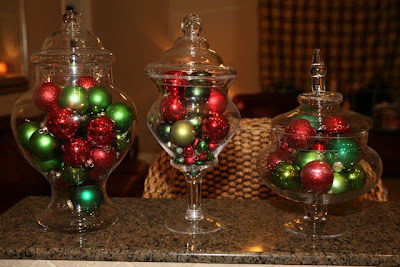 I love to fill apothecary jars or hurricane vases with Christmas balls for an easy decoration! I love this plate that says JOY above my TV. Joy is the theme of the season for me!!! I have one of these on either side of our TV cabinet. I just add some balls and these signs to jazz them up for Christmas! 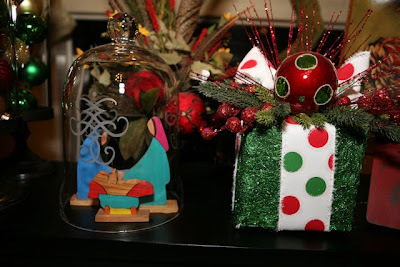 I love the present on this table and then under my cloche - I put a small part of a nativity scene I got in El Salvador. When we did a little Market shopping on our compassion trip - everyone seemed to collect Nativities from different countries and I thought that was a great idea! More balls in more containers! My mantel - we have stockings for me, Scott, Harper and Dawson (our dog). There is an extra stocking in storage in case we have another child. I bought all 5 of these years ago......just believing that one day they would all be monogrammed. This is mine and I love it. Harper's is just like this only it is red damask. I'm in the middle of having it monogrammed. So this stocking is for child #2 if we are blessed with one someday. Thank you for visiting our home. Psalms 126:3 says "He has done great things for us and we are filled with Joy" and that is truly how we feel. God has blessed us with a child that we thought we would not be able to have and then we thought we would not be able to keep and we are beyond thankful this year. We truly are celebrating Jesus as the reason for the season! Please come back and visit any time! your home is always beautiful! 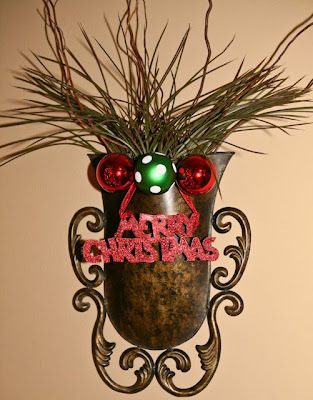 Thanks for sharing all your christmas decorations with us! Have a blessed Christmas! Beautiful! I wish I had even half your decorating ability. 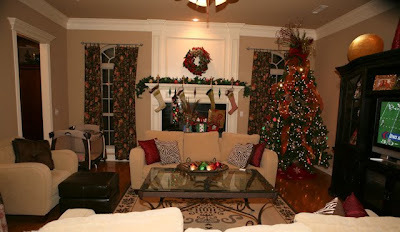 Your decorations are stunning, Kelly! Love it SO much! xoxo! The decorations are beautiful...but the last paragraph of this post....PRICELESS! Love it all. Your stockings are to die for. It looks great!!! So many awesome ideas! Gorgeous - thanks for sharing! BEAUTIFUL KELLY~ ALL OF IT, HARPER ESPECIALLY! 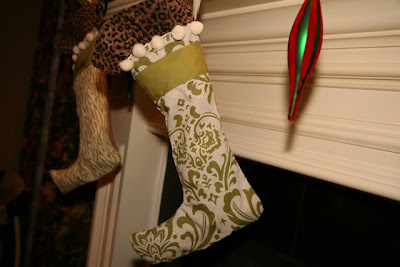 OH' AND THE STOCKINGS ARE BEAUTIFUL AND DARLING, I so would have one too, w/ cheetah print on it! Kelly your home is lovely, especially the little gift from above, Miss Harper. Thank you for sharing her with all of us " bloggie Aunts". Kelly your home is simply gorgeous!! THere's nothing I don't love!! My favorite are your Christmas trees!! It's all beautifuL! I love it Kelly! You've done such a great job! Very pretty! I love your hurricanes. I did one of these posts for the nester, too. I hope I don't forget to add mine to the links tomorrow! I'm usually good about remembering things like that four days after they happen. 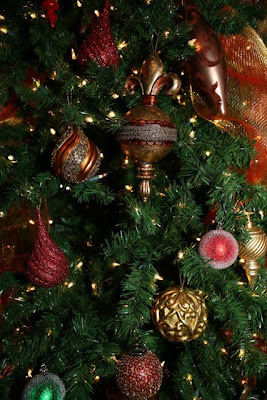 I love all of your different Christmas trees, how they all have different themes. Maybe one day when I have a house and a baby I will do that too. Thanks for sharing! The "Joy" plate is beautiful - I have the "Noel" plate. Thank you for sharing - I'm glad to know I'm not the only one that buys matching things ahead and trusting that the Lord will fill them. :-) Merry Christmas to you and your family - I'm sure it will be one to remember with Harper celebrating Christ's birth for the first time! I love the nativity from El Salvador. It's the best! I love all of your decorations! I came over from The Nester's Tour of Homes. Cute decorations- loving all the monograms! I scrolled down just enough to see that you are a Hogs fan and wanted to tell you that I'm from Texas (Go Horns!) but my husband I lived in Arkansas a few years back. He and the guys had a bet each year for the Arkansas/Texas game- whoever's team lost, he had to wear the other team's hat for the entire next week. I have such good memories of living in AR! (Don't mention Colt McCoy-I'm still sick over his "performance" last week.) Cute blog! Your home looks so festive! I also got a few ideas from looking at the wonderful pictures! I hope you have a great Christmas! GORGEOUS!!!! I love the zebra stuff, of course! 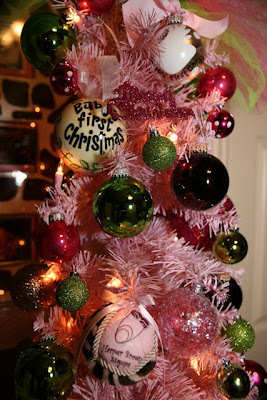 And Harper's pink tree is FAB! :) You have great taste, Kelly! Again...LOVE your decorations. Thanks for inspiring me. 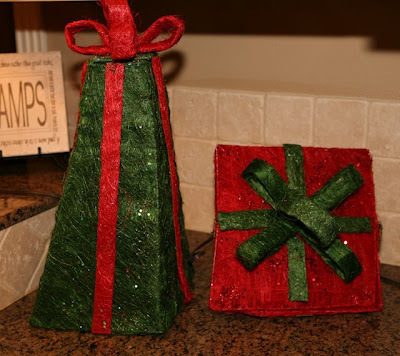 I used your ornament idea for our craft project last night. I had a girls' sleepover. Big and small...I just posted the pics. So beautiful! You're such a great decorator :) And of course Harper looks adorable as always!! Very pretty and what a beautiful home you have. Very Pretty! I love the red/green/zebara tree. And...Harper's tree...too cute. Merry Christmas. So pretty, Kelly! And best yet, you have a sweet little girl to enjoy this year- it'll only get better! I love the little pink tree. Your house looks fantastic. And your litle baby girl is adorable. Harper is a really cute name. Your house is just absolutely beautiful Kelly! You should be so proud! Kelly~I love your decorations! Thanks for sharing. I hope you have a wonderful Christmas! Kelly, I don't even know you but really enjoy your blog because you seem so sweet. You remind me of myself 30 years ago. 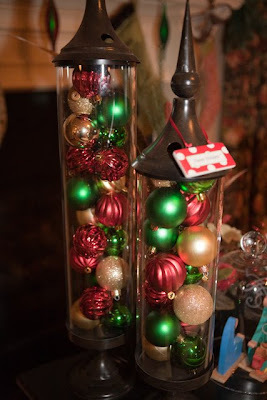 I gleaned an idea from your posts about putting all my odd ornaments in clear glass containers. Do you know that would work in the kitchen with all those clear glass whatevers that I like to sit around? (Yours might also be in the kitchen, I couldn't tell.) I love old depression glass and old stuff and have lots of ornaments too old for the tree but too neat to throw away. Thanks for that idea . . . . and I really liked Harper's tree. That pink seems to fit you. 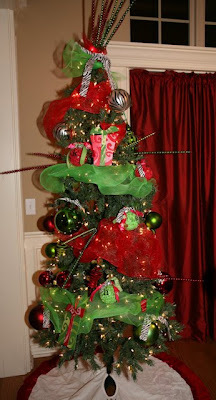 I put little green trees in my kids' rooms and love decorating them for the kids. I also have a kitchen tree that I put clear lights, red apples and antique kitchen tools hung by red ribbon . . . . I hang red potholders on it also. Thanks for sharing so much of what you do. It brings a lot of smiles. I have to confess that I laugh at all your monograms. I used to love monograms back in the 80's when designer-everything was chic. It is great to see people be themselves and to enjoy their personalities. You seem like a precious person. God bless you and Merry Christmas to you and your family. I love those stockings!! I'm getting so many ideas!!! 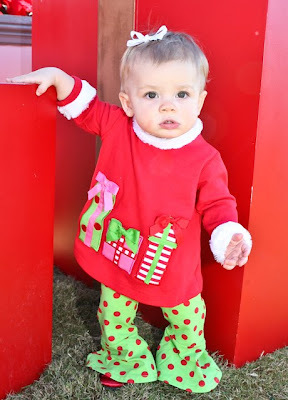 Beautiful:) I think I like Harper's tree best, though:) Love your stockings too...SO cute! Everything is gorgeous!! I love your style! Harper's tree is so fun! Have a merry Christmas and happy touring! You home is decorated beautifully. Thanks so much for giving me some great last minute ideas! I love all of your monogrammed items! There's nothing like the first Christmas with your child. Your home and decorations are beautiful Kelly! I know I've already seen a lot of these, but I loved looking at them again, Kelly! You're so creative - thank you for sharing! Some of my Christmas paintings look like they came from your house! Beautiful job. You're invited to see my home too. Come by soon! Your home looks beautiful! 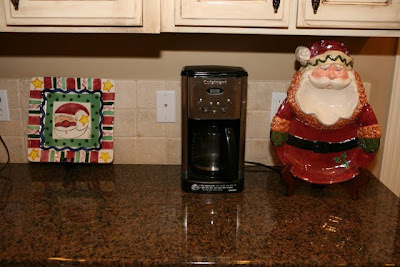 I love Christmas and I love seeing how other people decorate their homes. Your home is beautiful! I know I've said it before, but I do love Harper's tree :) It's so pretty! LOL that is the second pink tree I came across during this tour! I didn't even know they existed. Have a wonderful Christmas time your home is all ready for it. WOW! I love all of your trees! I love the mesh/tulle garland! Very pretty. And all of the monogram ideas are fabulous!! Just beautiful! I enjoy seeing your different trees. Getting some great ideas for next year. Thank you, as always for sharing! You and I have always exchanged "tour" comments (I am the one who frames our christmas card photo in a different frame every year). This year the tour completely snuck up on me and I do not have a post. 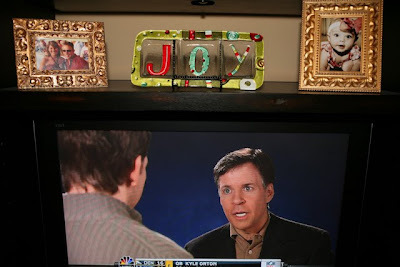 But your home looks GREAT and I love your JOY theme this year! 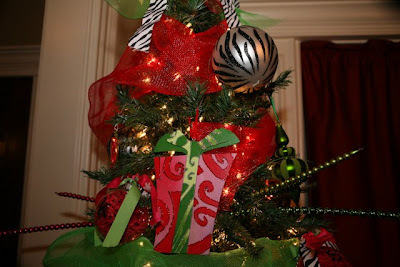 The red green and zebra tree is so much fun! And your daughters tree is just sweet! lovely! Random question...why do you stick to "H" baby names? I'm new to reading your site so maybe I missed the reason why...but I do love all of the "H" names! Your house is beautiful! 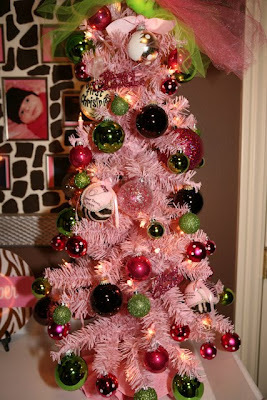 I love Harper's pink tree too! Very creative. Thanks for sharing and have a Merry Christmas! Beautiful! Love the pink tree. I seriously didn't know about the Nester tour when I posted my photos on my blog last week. Your home is absolutely beautiful thank you for sharing. Harper's tree and the big S on your tree are my favorites! You have such fabulous taste! I love Miss Harper's tree, so pretty! I guess I should do one like that for my girl next year. She'll be about 15 months and would love it. Your home looks wonderful and I wish you and your family a very Merry Christmas. Beautiful. 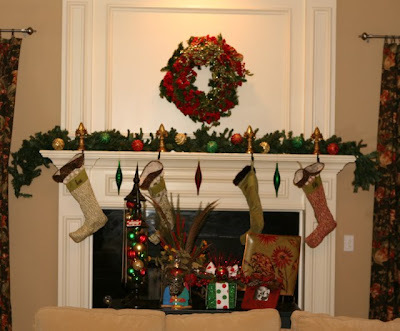 Love the way your mantle looks! You house looks so festive. I love all of your trees! Your home is absolutely beautiful. I know this is a very exciting Christmas for your family and pray for HIS blessings for all of you always. Thanks for sharing wonderful pictures. I love your decorations! Every tree was decorated so beautifully, especially the zebra tree. And what a coincidence, my daughter also has a pink tree and I just took her changing pad off her dresser because she is getting too big! And we also have the same coffee maker. :) I am a new follower, I just love your style and creativity! Gorgeous containers and jars... too, I love the cards in the beautiful red bowl (I might steal that one next year). Merry Christmas!!!! This is my first time to your blog. Your home looks lovely!!! I love the ornaments in the jars. I love all kinds of glass jars!!! Congratulations on your precious baby girl. She is a doll!!! God is so good. You have a beautiful, home! I love all your Christmas trees, but I'm especially fond of Harper's tree! Too cute. And what gorgeous stockings! Love, love it! Thanks for sharing your home with us. I so enjoy your blog when I have time to stop by. And, of course sweet Harper is cute as ever! Merry Christmas and a Blessed New Year to you and your lovely family! 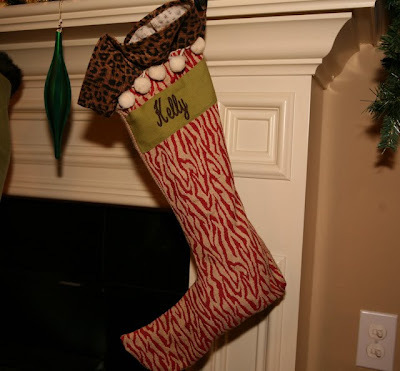 Kelly, I love the way you decorate for Christmas, with the leopard and all. It's beautiful & I know Harper must be having a ball looking at all the sparklies and seeing those trees for the first time. Thanks for joining my party, there are a lot of parties this year. Merry Christmas to you and your family! I love all the decorations, but my favorite is the 9ft tree. LOVE all of your decorations!!! Gorgeous!! Where did you get your stockings? Finally getting around some more houses on this year's home tour. Thanks for the tour - I especially love the presents in your kitchen. Love your nativity too, and I am having a Nativity Blog Carnival on 21 December on my blog and it would be wonderful if you could join in.